Katharine Graham is the first female publisher of a major American newspaper — The Washington Post. With help from editor Ben Bradlee, Graham races to catch up with The New York Times to expose a massive cover-up of government secrets that spans three decades and four U.S. presidents. Together, they must overcome their differences as they risk their careers — and very freedom — to help bring long-buried truths to light. KIDS FIRST! Film Critic Gerry O. comments, “The story comes to life under the masterful direction of Steven Spielberg. His most famous techniques are clear from the very first shot and continue throughout the film. In fact, the first scene, which takes place in the jungles of Vietnam, will remind you of Saving Private Ryan due to the heart-thumping sound design and chaotic cinematography that puts you right on the battlefield.” Clayton P. adds, “The Post is very timely and reflective of our own time. In this day of “fake news” and media bashing, this film is a refreshing story of the integrity of newspaper organizations. Spielberg tries to show the importance of a free press in combating government malfeasance.” See their full reviews below. There are very few films every year that keep you excited and entertained while delivering impressive visual achievements. The Post does not belong in this category because it far surpasses any expectations and delivers on a much higher level. Every single aspect of this film -from acting to directing to editing – are all superb. The Post has many things to offer, but the biggest would be the drama surrounding this very real story. It feels like an adventure, even though it takes place on East Coast. It is sprinkled with just the right amount of funny moments here and there, with hilarious and perfectly timed jokes. Out of all the spectacular cinematic achievements, none of them would be possible without the exciting and truly eye-opening story. It dives into a major leak of top-secret information, ranging multiple U.S. presidents, all relating to the Vietnam War. At first, the film seems to be about the two newspapers, The New York Times and the Washington Post, both attempting to get this story. Later, it turns into a fight between freedom of the press and censorship as the Nixon Administration attempts to block both newspapers from publishing any information about their secrets. The story comes to life under the masterful direction of Steven Spielberg. His most famous techniques are clear from the very first shot and continue throughout the film. In fact, the first scene, which takes place in the jungles of Vietnam, will remind you of Saving Private Ryan due to the heart-thumping sound design and chaotic cinematography that puts you right on the battlefield. The cast has their own achievements. 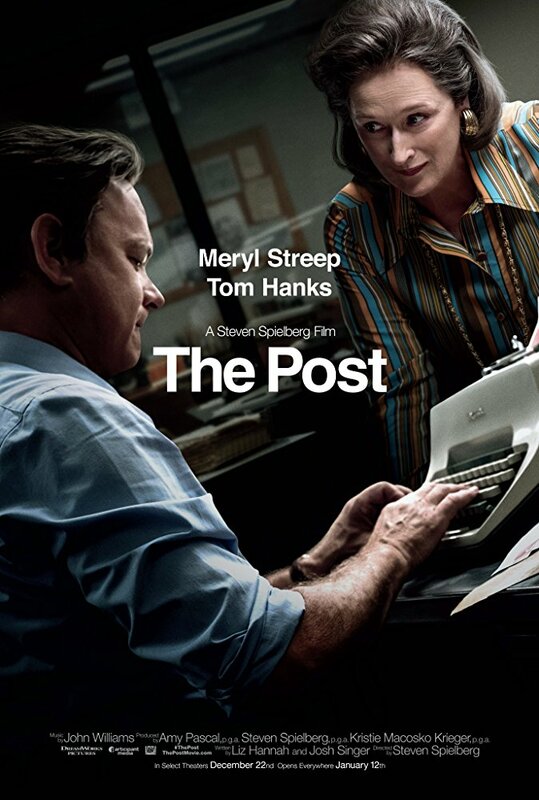 Tom Hanks (Ben Bradlee) and Meryl Streep (Kay Graham) work perfectly together and truly become their characters. John Williams, the Composer for the film, manages to take the spotlight from the visual scenes and put them into the music. His original score sounds incredible and you’ll find yourself swallowed by the soothing and memorable tones. But what really looks impressive in The Post is the film grain. The quality looks like a modern film, yet the colors and the lighting make it feel like the 60s which adds to the realism of the story. The cinematography defines my favorite scene, the climax of the film. Kay Graham, publisher of the Washington Post, has to make the final decision whether the paper should publish the leaked documents or not. She is on the phone with multiple business partners, her editor (Ben Bradlee), and many journalists of the paper as well as some of her board advisors. Easily, this makes for the most intense scene in the entire film and truly brings Meryl Streep’s character to life. Throughout the phone conversation, the camera angles make it feel like one long shot across multiple locations. Finally, at the moment she makes her decision, the camera slowly zooms into her eyes and mouth to show wonder, fear, curiosity and more – all at once. Finally, as Kay makes her decision, the camera zooms out and the feeling of intensity immediately leaves the room. Despite being just a few minutes long, it feels like an eternity and you, as a viewer, can’t help but clench your fist in anticipation of what her decision will be. The story has many mature elements and the concept itself is complicated at times. The messages related to journalistic oppression are very important for all ages. I recommend this to ages 10 to 18, as well as adults. I give it 5 out of 5 stars for perfect directing, astonishing acting, and cinematography so beautiful it belongs in an art gallery along with many other films directed by Steven Spielberg. It is available in theaters January 12, 2018 so check it out. Spielberg’s The Post is a paean to the American ideal of freedom of the press. This highly intense, suspenseful film tells the story of Katherine Graham, owner of The Washington Post and its historic role in the publishing of the Pentagon Papers in 1971. Directed by Steven Spielberg, the films stars Meryl Streep as Katherine Graham, Tom Hanks as the Post’s editor, Ben Bradlee and a top ensemble cast. Set in the classic age of newspapers and network television, before the internet age, The Post is a coming-of-age story on two fronts. The Washington Post goes from being a regional media outlet to a national newspaper of note. In the process, Katherine Graham, goes from being a society hostess to a strong female corporate owner. A former government analyst finds proof of a government cover-up regarding American involvement in Vietnam and leaks the information to The New York Times and The Washington Post. Graham’s editorial team is in favor of publishing the material because it’ll put the newspaper on the map, so to speak. Her legal and financial team are against it and warn that she could go to jail for contempt and lose the newspaper. What follows is an intense examination of all the pros and cons of the issue. One of the most fascinating parts of the film is seeing the inner workings of creating a newspaper – the old printing presses, the dyes, the plates with all the metal letters and etchings of pictures. Spielberg clearly loves the traditional craft of printing a newspaper. The John Williams music is perfect for the suspenseful plot. The acting is impeccable. Both Meryl Streep and Tom Hanks have such amazing craft that they imbue their roles with intelligence and humanity. The beginning of the film sets up the true-to-life plot and players. Because of this, the beginning of the film may be difficult for younger viewers because they aren’t aware of the politics of the 1970s. The Post is very timely and reflective of our own time. In this day of “fake news” and media bashing, this film is a refreshing story of the integrity of newspaper organizations. Spielberg tries to show the importance of a free press in combating government malfeasance. The Post is appropriate for ages 15 to 18. Younger teens may find the film boring if they are not interested in politics or media. I give this film 4.5 out of 5 stars for its exceptional use of real life suspense. It is available in theaters January 12, 2018 so check it out.